The Inventors’ Network is a voluntary membership organization composed of individuals wishing to encourage the development of new ideas and to promote the spirit of innovation through the seeking and sharing of information. Inventors’ Network is accomplishing this goal by focusing the individual and collective experience and expertise of its members, and others, to assist inventors and innovators through the process of bringing their ideas to use, either through commercialization or noncommercial dedication to public betterment. The organization concentrates on providing information which will minimize the investments of time, expense and frustration inventors often experience in developing their ideas. The association has established and operates regular and occasional, meetings, programs, workshops, displays, seminars, counseling and other educational activities. The organization acquires and makes available reference materials and informational resources which will aid in the innovation process. 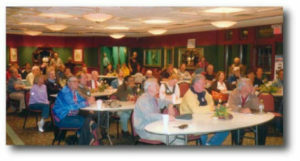 The group provides a forum where persons and companies can meet and interact. It allies with groups who have similar interests. All of our activities support the advancement of economic activity and the well being of society. As a matter of policy, the Inventor’s Network does not endorse, qualify, or make any representations concerning the business practices of any member, speaker, visitor or guest of the Inventor’s Network. The 5:30PM Tech Workshops and 7:00PM meeting are held at Dunwoody College Of Technology. Click on the EVENTS button at the left for more information about this months meeting. Monthly inventor networking meetings are held on the third Tuesday of each month. Gallery of inventors events and inventions. Inventors Resource Directory Of Service Providers. Useful Information Links For Inventors. Contact information for Inventors’ Network.